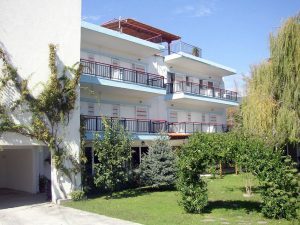 Our complex located it only 150 meters away from the amazing beach of Asprovalta Greece and 600 meters away from the center of Asprovalta village. The studios consist of a single room with a double bed, a single bed and a fully equipped kitchen. The two-room apartments consist of 2 bedrooms and a separate kitchen. One bedroom has 1 double bed and 1 single bed, the second bedroom has 2 single beds. The kitchen is separate and fully equipped. The two-bedroom apartments consist of 1 bedroom and a living room. One bedroom has 1 double bed and 1 single bed, the living room has 2 single beds. In the same room there is a fully equipped kitchen. New Tourist Accommodation Tax will be paid at the reception upon arrival.